The Bay class is a ship class of four dock landing ships built for the British Royal Fleet Auxiliary (RFA) during the 2000s. They are based on the Dutch-Spanish Royal Schelde Enforcer design and intended as a replacement for the Round Table-class logistics ships. Two ships each were ordered from Swan Hunter and BAE Systems Naval Ships. Construction work started in 2002, but saw major delays and cost overruns, particularly at Swan Hunter's shipyard. In mid-2006, Swan Hunter was stripped of work, and the incomplete second ship was towed to BAE's shipyard for completion. All four ships, Largs Bay, Lyme Bay, Mounts Bay, and Cardigan Bay had entered service by 2007. Since entering service, the Bay-class ships have been used for amphibious operations, training of the Iraqi Navy in the Persian Gulf, counter-drug deployments in the Caribbean, and relief operations following the 2010 Haiti earthquake. In 2010, Largs Bay was removed from service as part of the Strategic Defence and Security Review. She was sold to the Royal Australian Navy (RAN) in 2011, who operate her as HMAS Choules. The Bay class was designed as a replacement for the five Round Table-class logistics ships operated by the RFA. Planning for the class began in the 1990s, after the original intent to modernise and extend the service life of three Round Tables ran into problems with extensive corrosion and problems implementing new safety standards. After the first Round Table returned to service two years late and after excessive cost, the Ministry of Defence began to investigate the acquisition of new ships. In April 2000, the MoD released an Invitation to Tender for two ships under a budget of £150 million, with the option to acquire three more. Appledore Shipbuilders, BAE Systems Naval Ships and Swan Hunter submitted tenders, but only Swan Hunter's design met all the tender requirements, at a price of £148 million. A shortfall of work for BAE's Govan yard led to fears that it could not deliver the Type 45 destroyers and Queen Elizabeth-class aircraft carriers planned for later in the decade, so the Treasury agreed to fund an additional two LSDs to be built at Govan. The contract for Largs Bay and Lyme Bay was awarded to Swan Hunter on 18 December 2000 and the £122 million contract for Mounts Bay and Cardigan Bay was awarded to BAE on 19 November 2001. Construction on Largs Bay started at Swan Hunter on 28 January 2002, and on Mounts Bay at BAE on 25 August 2002. Swan Hunter struggled to manage the project and contain costs; only 7% of the design drawings were provided on time and more than 52% were over a year late. Swan Hunter's owner, Jaap Kroese, has blamed the MoD for continually changing the specifications. The extent of the problems only came to light in September 2003, when Swan Hunter said they could not fulfill the contract at the agreed price. In November 2004, progress on Largs Bay was delayed by water entering two engines during engine trials, putting the planned first of class behind work on BAE's first ship. The following month the government agreed to pay Swan Hunter an extra £84 million under new contract terms, but in June 2005 Swan Hunter said that they still could not finish the job within budget. This led to their contract being cancelled and BAE taking over the project in July 2006. In total Swan Hunter had been paid £342 million and BAE £254 million, making a total of £596 million for the four ships. Mounts Bay entered service in July 2006, followed by Largs Bay in November of that year, 28 months later than originally planned. The incomplete Lyme Bay was towed to Govan for completion by BAE. Lyme Bay was dedicated on 26 November 2007; the last ship of the class to enter RFA service. The ship was the only warship built by Swan Hunter but not completed; she marked the end of shipbuilding on the Tyne, as soon afterwards Swan Hunter sold its equipment to India and reinvented itself as an engineering consultancy. The Bay class is certified as a class 1 passenger ship, with design similarities to ro-pax ferries. The design is based on the Royal Schelde Enforcer, a joint project between the Dutch and Spanish resulting in the Rotterdam-class and Galicia-class amphibious warfare ships. The main difference is that the British ships have no helicopter hangar. 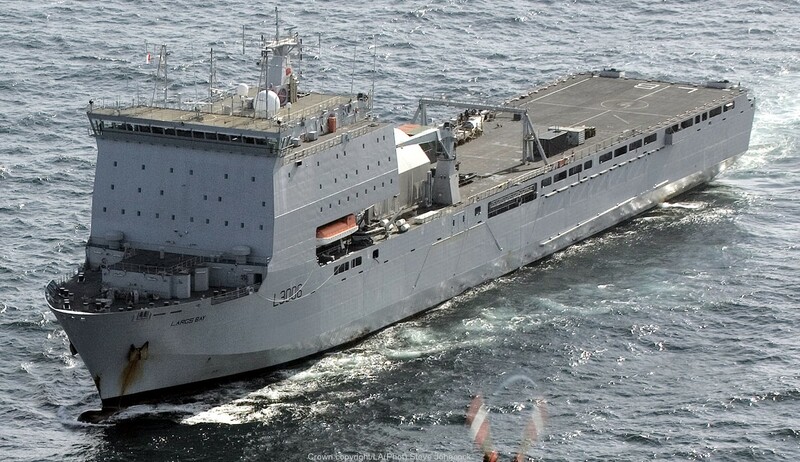 The ships were originally designated Auxiliary Landing Ship Logistics (ALSL), but this was changed in 2002 to Landing Ship Dock (Auxiliary) (LSD(A)), better reflecting their operational role and bringing them into line with the NATO designation for the Royal Schelde vessels. The Bay-class ships have a full load displacement of 16,160 tonnes (15,900 long tons). They are 579.4 feet (176.6 m) long, with a beam of 86.6 feet (26.4 m), and a draught of 19 feet (5.8 m). Propulsion power is provided by two Wärtsilä 8L26 generators, providing 6,000 horsepower (4.5 MW), and two Wärtsilä 12V26 generators, providing 9,000 horsepower (6.7 MW). These are used to drive two steerable azimuthing thrusters, with a bow thruster supplementing. Maximum speed is 18 knots (33 km/h; 21 mph), and the Bay-class ships can achieve a range of 8,000 nautical miles (15,000 km; 9,200 mi) at 15 knots (28 km/h; 17 mph). The ships were designed to receive an armament of two Phalanx CIWS, two manual 30 mm DS30B cannon and various small arms, but the exact weapons fit varies within the class. In British service, the everyday ship's company consisted of 60 to 70 RFA personnel, with this number supplemented by members of the British Armed Forces when the ships are deployed operationally. 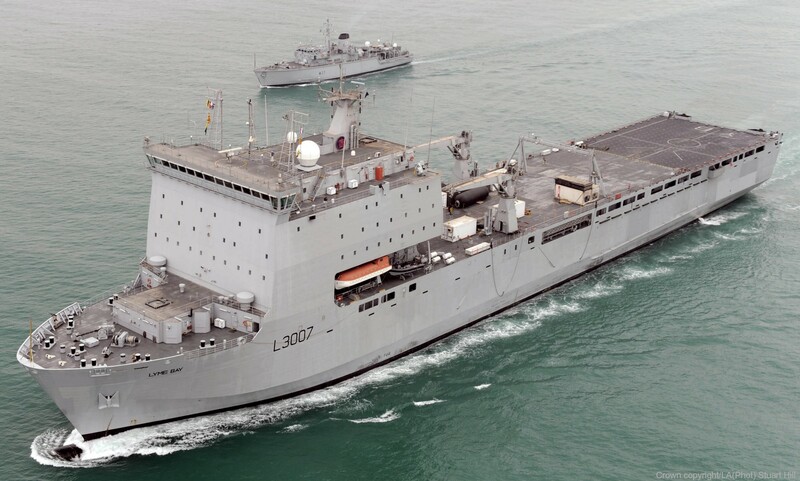 For example, Largs Bay's deployment in response to the 2010 Haiti earthquake saw her sail with a core crew of 70, plus 40 Royal Logistic Corps personnel for boat- and cargo-handling duties, and 17 from the Royal Navy and Royal Marines for security and related tasks. Australia operates Choules with a permanent crew of 158 including a Ship's Army Department of 22. 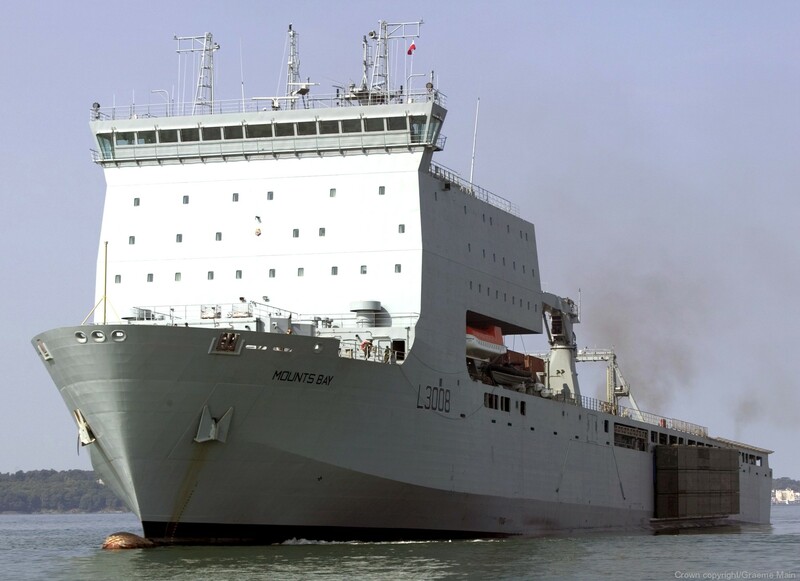 As a sealift ship, each Bay-class vessel is capable of carrying up to 24 Challenger 2 tanks or 150 light trucks in 1,150 linear metres of space, with stern- and side-ramp access to the vehicle deck. The cargo capacity is equivalent of 200 tons of ammunition, or 24 twenty-foot equivalent unit containers. During normal conditions, a Bay-class ship can carry 356 soldiers, but this can be almost doubled to 700 in overload conditions. The flight deck is capable of handling helicopters up to the size of Chinooks, as well as Merlin helicopters and Osprey tiltrotor aircraft. There is no hangar for long-term embarkation of a helicopter, although a temporary shelter can be fitted to house a Merlin or smaller helicopter. The well dock can carry one LCU Mark 10 or two LCVPs, and two Mexeflotes can be suspended from the ship's flanks. Two 30-ton cranes are fitted between the superstructure and the flight deck. Internal passages are wide enough to allow two fully kitted marines to pass each other.